I will never underestimate April – it’s a fabulous month for birding. It’s the best time of year to see sapsuckers and kinglets and creepers and hermit thrushes and fox sparrows and winter wrens. These are among the “classic” April birds we look forward to annually. By the first of May, most of them are gone, pulled north by the migratory urges that dictate their movements. Yet as all birders know, April is just an appetizer. The main course is May. 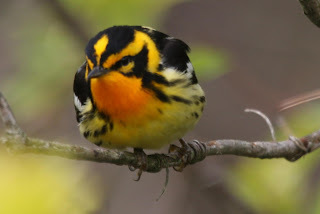 Spring migration will soon reach its peak, and that means serious color: warblers, tanagers, grosbeaks, orioles and buntings. Some of these spectacular birds will hang around all summer, raising their families here. But most will not, especially the warblers. About 30 members of the wood warbler family visit this region between mid-April and June 1. We covet these neotropical migrants for their vivid markings and often complex vocalizations. Finding them and identifying them can be a challenge, but that’s part of the attraction. See or hear 20 or 25 warbler types this spring and you’ve done very well. If you’re new at this, just seeing a few species will leave you fulfilled—and perhaps wondering why you didn’t start this hobby earlier in life. A good variety of May warblers will likely visit your backyard—watch your trees and shrubs carefully. Local parks, forest preserves and golf courses are the prime viewing spots, and don’t forget Morton Arboretum. The best strategy is simple: get outside as much as possible. Pick a place and go! A good way to maximize your birding time is to join a group field trip. Check the websites of the DuPage Birding Club and Kane County Audubon to see all the choices. Both clubs welcome non-members on their trips, and it’s fun to experience the wonders of spring migration with others who are passionate about birds. Group outings are especially productive for beginners—there’s really no easier way to learn about birds than tagging along with people who enjoy sharing their knowledge. Birders are a sociable lot, and most are eager to assist. The Biggest Week in American Birding, May 6-16, Lake Erie Marsh Region. A handful of sites in Northwest Ohio, including Magee Marsh and Ottawa National Wildlife Refuge, are known collectively as the “Warbler Capital of the World.” In May, the title well deserved. Go there and you can’t miss, plus you’ll get to rub elbows with Kenn Kaufman, a birding celebrity. Details are online at biggestweekinamericanbirding.com. Horicon Marsh Bird Festival, May 7-10, Horicon, Wis. The black terns and yellow-headed blackbirds are enough for me, but Horicon in May holds way more than just marsh birds and waterfowl. Some 268 species have been observed at this vast and vital wetland preserve. It’s an amazing place, and not so far away. Visit horiconmarshbirdfestival.com. Kirtland’s Warbler Wildlife Festival, May 15, Roscommon, Mich. See and learn about the rarest warbler of all! Kirtland’s is one warbler that you’ll probably never encounter in DuPage County and it has a fascinating story. A bird that merits its own festival is definitely worth the drive! For details, go to warbler.kirtland.edu.